This plant can grow red, pink and white berries. 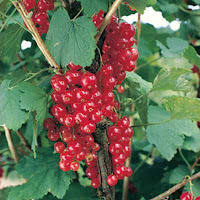 The red currant is native to Western Europe and grown a lot in people's backyard. The shrubs can grow up to 3 to 6 feet tall and the berries grow in clusters and are about the size of a blue berry. The shrubs like to be planted in full sunlight and don't require any particular soil. They love humidity though, but require low to no maintenance. As far as known, the first red currants were cultivated and produced in Belgium and northern France in the 1600s. They are very common in the Netherlands and I loved eating a bowl of them with either sugar or sweetener, because the taste is rather tart and sour. They are very tasty in yogurt as well. These berries are rich in vitamins B1 and C and provide lots of iron, phosphorus, potassium, fibre, copper and manganese. Several medicinal purposes the berries have are to reduce fever, induce sweating and menstrual-flow. They are a mild laxative, astringent, increase appetite and have diuretic and digestive properties. Dried currant leaves can be used for tea and is said to ease the symptoms of gout and rheumatism. Compresses help healing wounds and a gargling solution is ideal for mouth infections. The best way to get these berries of the stem is to place the top of the stem between the teeth of a fork and pull the fork down; the berries will come off easily and it takes hardly any time to get a bowl full. Other culinairy uses are preserves, pies, juice, or as addition to salads and drinks. I found many recipes online for cooking with these little red berries, but they are just as good when eaten raw. Even though their taste might be a little sour, they can enhance the flavor of a dish. Even though God's word may go contrary to your feelings and desires, it will definitely enhance your life and ensure your happiness. It is always best to do what you know would be pleasing to God. It will never go unnoticed!